XPTaskBar represents a Windows XP like task menu panel. 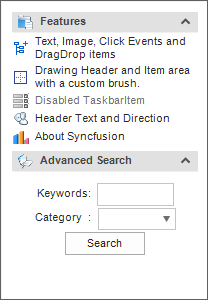 It helps display a set of command items (XPTaskBarItem) or frequently used features (like “Search”, “Advanced Search”, etc) in panels, that can be classified, contained and displayed within one or more command boxes (XPTaskBarBox). Header settings - Provides options to customize the text, appearance, font and size of the XPTaskBarBox header. Layout orientation - Provides options to customize the layout to be horizontal or vertical. Padding - Provides options to customize interior spacing, horizontal and vertical padding using integer values. Visual style - Provides rich set of style to customize the look and feel of XPTaskBar.